The National Fenestration Rating Council (NFRC) is responsible for establishing benchmark performance ratings for all energy-efficient windows, doors, and skylights. 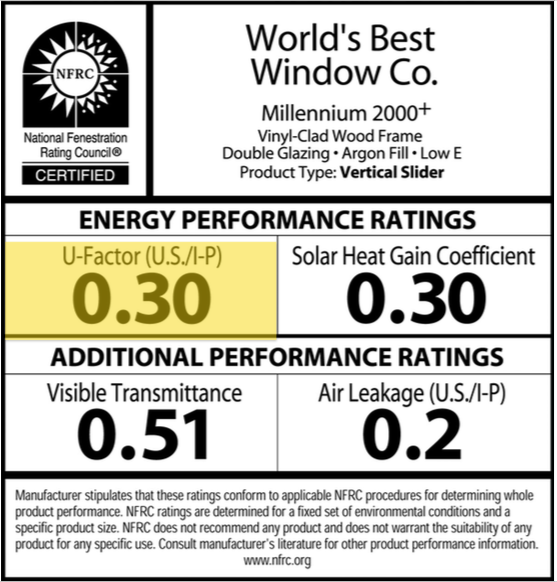 NFRC labels allow customers to compare various energy-efficient products across the board. To some, the NFRC label is an important factor when purchasing a new window. But to many, the NFRC label is often looked over, and usually not taken accounted for properly. These labels can hold a lot of information regarding the quality of the window you’re looking to purchase. An NFRC label addresses four main components: U-Factor, Visible Transmittance, Solar Heat Gain Coefficient, and Air Leakage. It’s important to note the NFRC label only pertains to the thermal property of the window itself. The structural, commercial, and residential grade are not taken into account. The U-Factor measures the insulating value of the window, which runs on a scale from 0.20 to 1.20. The lower the U Value, the more insulated the window. 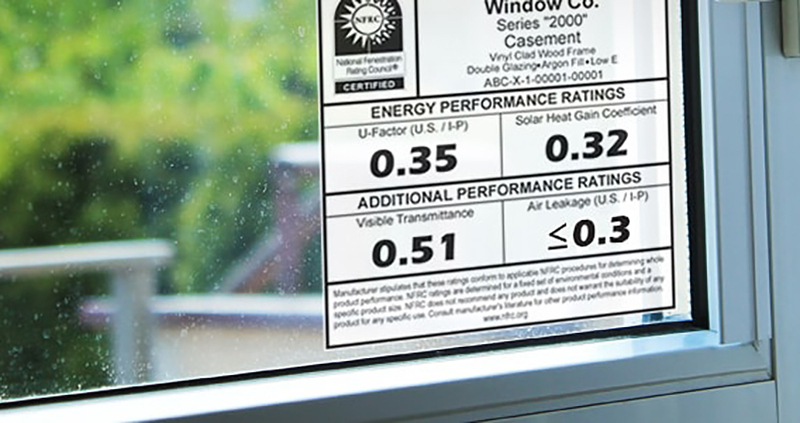 To receive the New Mexico Energy Star rating, a window must be rated at least a 0.35. Windows made with Argon gas can achieve results 0.27 or lower. Another way to think about the U-Factor is by comparing it to the R Value of fiberglass (which is responsible for insulating your walls). The two values are contrasting, so the U-Factor is the reciprocal of the R value of fiberglass (or 1/R). For example, the R value of R-19 is considered higher quality than that of R-11 (the higher the value the better), while a U-Factor of 0.35 is considered better than a value of 0.40. The Solar Heat Gain Coefficient (SHGC) measures the amount of outdoor heating entering the home. The SHGC is expressed as a number between 0 and 1. The lower the SHGC, the better the window is at blocking unwanted heat gain. A low SHGC can result in lower AC costs during the Summer as your home is keeping out the warmer air and keeping in the cooler air. Air Leakage (AL) measures how efficient the window is at keeping outside air out of the home. This rating is especially important in New Mexico, as there tends to be a lot more dust in the air. If keeping air infiltration at a low is important to you consider casement or fixed windows, as these tend to have a better seal. AL is measured between a 0.1 and 0.3. The lower the AL, the better the product is at keeping drafts out of the home. The state of New Mexico requires all NFRC labels to show an AL value equal to or less than 0.3. Since this is the only NFRC component manufacturers are not required to include, it can be assumed labels with no AL rating could yield an AL value of 0.3 or higher. If air infiltration ratings are important to you, make sure to get these ratings directly from the manufacturer as the label may not reflect the actual value. Glass-Rite windows are nationally certified and rate better than most national brands. Our windows have some of the best air tightness you can find–which is not reflected on the NFRC label. All of Glass-Rite windows have an AL rating of BELOW 0.1 (the NFRC label shows the full 0.1).